Tarquin’s Cornish Navy Seadog Gin has been awarded Best Gin at the San Francisco World Spirits Competition 2017 – the Oscars of the spirits world. Selected by expert judges, who blind tasted 268 global entries, Tarquin’s Cornish Navy Gin by Southwestern Distillery was named Best in Show at the world’s most respected and influential spirits contest. Tarquin Leadbetter, a 29-year-old self-taught distiller, started making craft gin six years ago on his cooker at home in Cornwall. Starting on a shoestring using rustic equipment, he began selling his handcrafted Cornish gin commercially to local pubs in 2013, from the boot of his car. He has since grown his micro distillery organically and now exports his artisan gin to over a dozen countries. 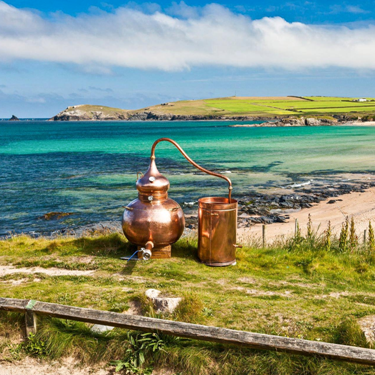 Crafted near Padstow, in Cornwall, Tarquin’s Gin was the first new gin to be distilled in southwest England for over 100 years. Inspired by the wild Cornish coast, the landmark spirit is crafted in small batches of 300 bottles at a time. It is distilled with Cornish water and infused with local violets and fresh orange zest to create its unique aromatic flavour. The 2017 award winner, Tarquin’s Cornish Navy Gin, is bottled at 57% ABV and was initially launched in 2016 as a limited edition gin to commemorate the disbanding of Cornwall’s Royal Navy Rescue Squadron, 771. This special, zesty and bold gin was hugely popular and sold out immediately. Tarquin quickly added it to Southwestern Distillery’s permanent collection alongside his flagship, Tarquin’s Cornish Gin (42% ABV). Made using the same traditional distilling and hand-finish methods, the navy strength gin uses increased botanicals to balance the alcohol strength and maintain the unique Tarquin’s Cornish Gin flavour. The award-winning gin boasts a superbly smooth finish and rounded sweetness with notes of cracked black pepper, candied citrus and rich spice.